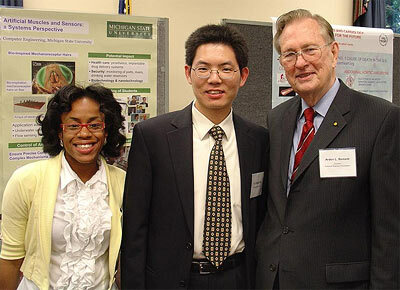 ECE alumnus Prof. Xiaobo Tan (center) with MSU Ph.D. student Dawn Hedgepeth (left) and National Science Foundation Director Dr. Arden Bement (right). ECE alumnus Dr. Xiaobo Tan, assistant professor of electrical and computer engineering at Michigan State University (MSU), presented his research at the 14th Annual Coalition for National Science Funding (CNSF) Exhibition and Reception on Capitol Hill on the evening of June 25, 2008. CNSF is an alliance of over 100 institutions and professional societies (including MSU) that supports the goal of increasing the national investment in the National Science Foundation's research and education programs. The annual Capitol Hill exhibition event features research and education projects supported by NSF, and shows lawmakers the impact of NSF-funded programs. Dr. Tan, Associate Dean Leo Kempel, and MSU Ph.D. student, Dawn Hedgepeth presented a poster titled "Electroactive Polymers as Artificial Muscles and Sensors: Investigation from a Systems Perspective," that described Tan's NSF CAREER project and its potential societal, educational, and outreach impacts. Prof. Tan and his fellow MSU presenters also offered live demos of artificial muscle-enabled robotic fish for congressmen and their staffers. Earlier during the day, Prof. Tan met with a number of Michigan congressional delegation offices to advocate for NSF funding. Xiaobo Tan earned his Ph.D. in electrical engineering at the University of Maryland in 2002 and was advised by Professor John Baras (ECE/ISR) and Prof. P. S. Krishnaprasad (ECE/ISR). For more information about CNSF, visit www.cnsfweb.org.